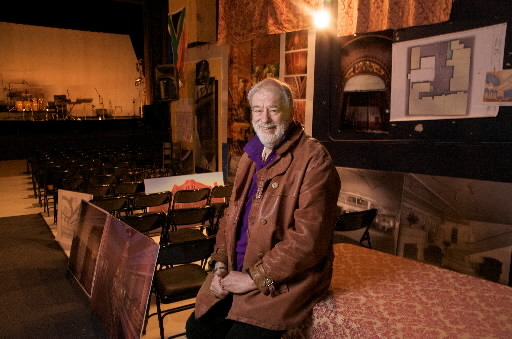 Farewell to Ray Shepardson, the Visionary Who Saved the Theatres | Paul's Voyage of Discovery & Etc. 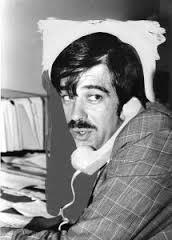 I honestly had no idea how to headline this tribute to the great Ray Shepardson, who died suddenly and shockingly in Aurora, Illinois late last night. It sounds like a cliché to say that Ray was full of life and larger than life – but if you knew him as his friends and associates knew him, terms like “dynamo” and “whirlwind” and “passionate” and, yes, “madman” were all frequently employed in the fruitless struggle to capture Ray in mere words. 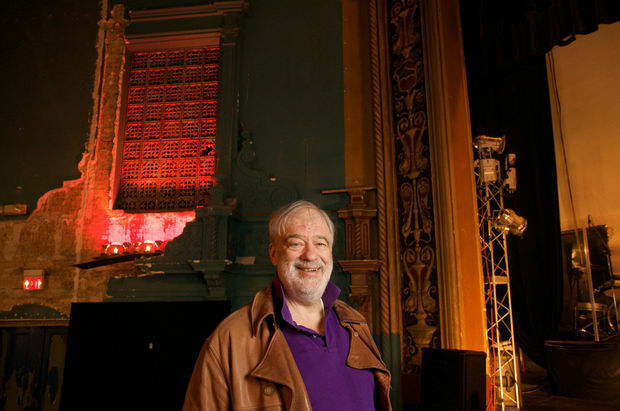 The man who saved dozens of great old theatres and movie palaces from the wrecking ball was a man of prodigious energy, drive, and “can do” creativity. I was a teenager in Cleveland, Ohio when I first felt the vibration from the human shockwave that was Raymond K. Shepardson. And I wouldn’t have any idea who he was for another thirteen years. 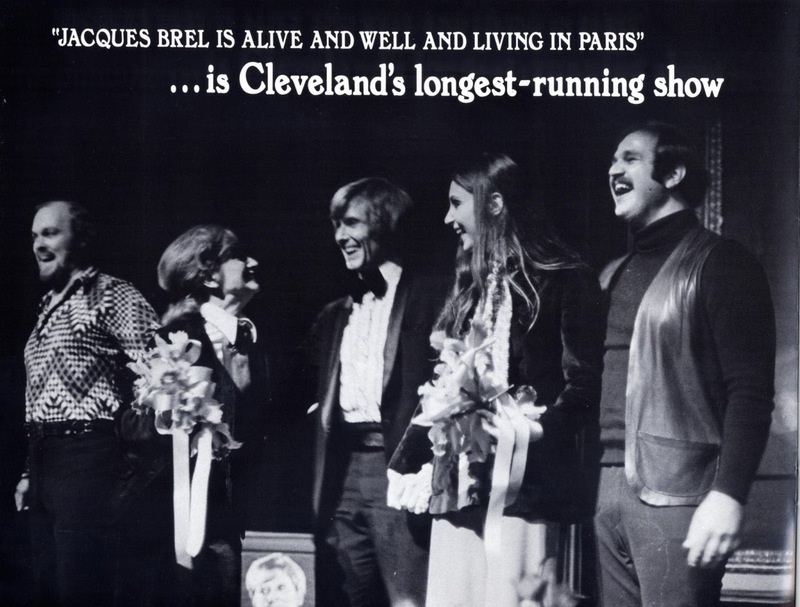 In 1973, my mother took me to see a production of “Jacques Brel Is Alive and Well and Living in Paris” that was staged in the lobby of the State Theatre in Cleveland’s downtrodden, downtown Playhouse Square district. I was just 15 years old, but I knew that this long-running version of “Jacques Brel” was something special – and that there was a lot of excitement in my proud hometown about a surprisingly successful effort to save this group of old movie palaces and Broadway road houses in a city that had been on a long losing streak. Inspirational young Ray waging the good fight at Playhouse Square. 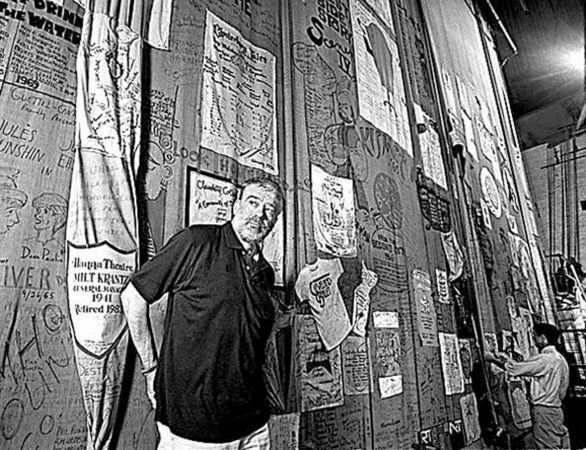 At that time, I had no idea who Ray Shepardson was, or that he was the person behind the movement to preserve the theatrical and cultural glory of downtown Cleveland. Tonight, four decades after I experienced “Jacques Brel” in the State Theatre lobby, the lights went out in Playhouse Square. 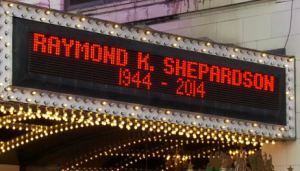 The theatres that Ray saved dimmed their marquees in memory of the educator-turned-preservationist who inspired and orchestrated their revitalization. I met Ray thirteen years after “Jacques Brel”. Neither of us was living in Cleveland anymore. 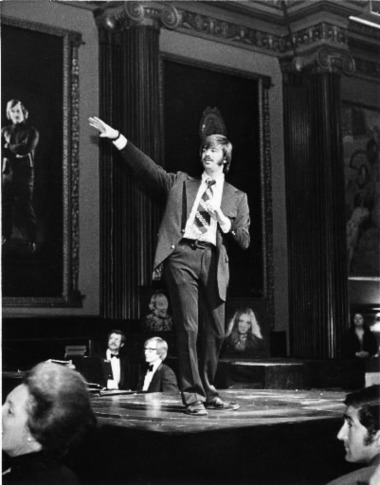 I had come to Chicago in 1976 to attend Northwestern, graduated in 1980, and in 1986, was performing with my future wife, Victoria Zielinski, in a comedy revue for my own theatrical enterprise, The Practical Theatre Company. Our friend and fellow Northwestern alum, Drew McCoy had come to Chicago to work on the grand reopening of The Chicago Theatre: one of the finest old movie palaces on State Street in the Loop. Drew helped Victoria get a job selling seats in the luxury box level. 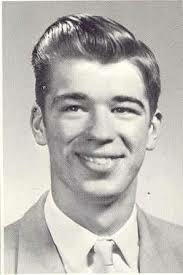 And that brought us into orbit around the force of nature called Ray Shepardson. 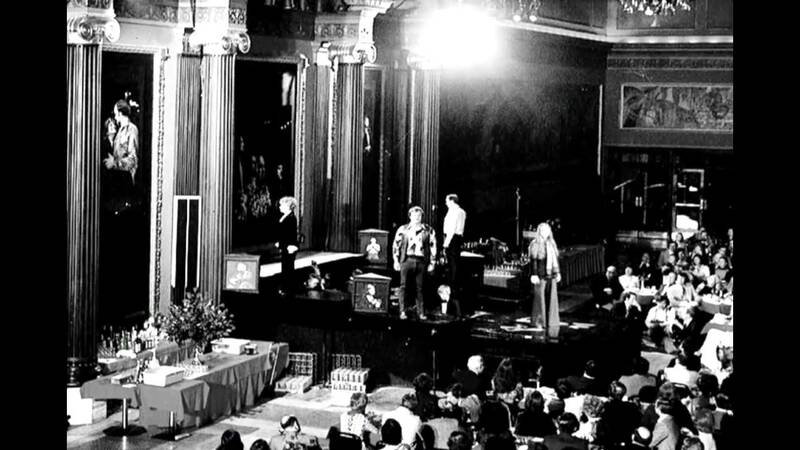 He was a restless, relentless bear of man, hustling through the bowels of The Chicago Theatre with a towel around his neck, quick-witted and brimming with bravado. I’d played Professor Harold Hill in high school and I recognized “The Music Man” in Ray: the persuasive, undeterred, incorrigible charm and salesmanship. But Ray’s accomplishments were far more legitimate than Harold Hills bogus “think system”. In the years after saving Cleveland’s Playhouse Square, Ray had wrought his restorative magic on The Fabulous Fox Theatre in St. Louis (built in 1929) – where our friend Drew first worked with the great man. Ray had also supervised the 1983 restoration and programming of The Wiltern Theatre in Los Angeles (built in 1931). Now, Ray was getting The Chicago Theatre (built in 1921) ready for a grand reopening featuring Frank Sinatra in concert. And, thanks to my girlfriend Victoria and my buddy Drew, I had a ringside seat. When Ray and I finally made the Cleveland-“Jaques Brel”-Playhouse Square connection, we became fast friends. It was a friendship that, for the next 28 years, I could always pick up right where we had left off. Until yesterday. 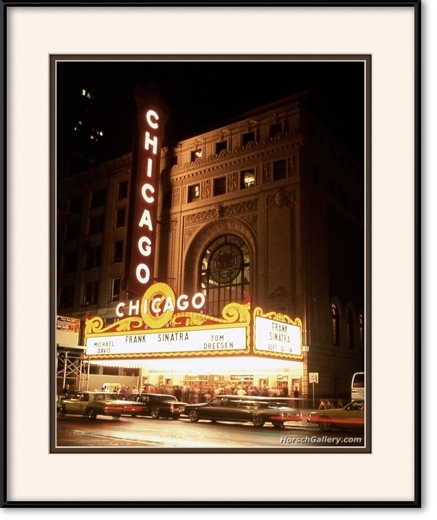 But I’d rather go back to that glorious day when The Chicago Theatre reopened on September 10, 1986. My fellow Practical Theatre cast members and I were on the red carpet — opening the main doors wearing white gloves and tuxes. My future wife was prowling the luxury box level. My friend Drew was wearing a path from backstage to the box office. Frank Sinatra sang “My Kind of Town” – and Ray Shepardson was at the height of his powers. In the years that followed, Ray was involved in more than 30 restoration projects across the country. He was the irrepressible, uncontrollable and iconoclastic savior of historic vaudeville and movie theatres across the country – taking dowdy old pleasure palaces and returning them to their original, gilded luster. More than two decades later, Ray helped make it happen for Victoria and me when we wanted to take our comedy revue, “The Vic & Paul Show” on the road. Not only did Ray help us beat the drum and get the press to our 2011 run at Mayne Stage in Chicago – he was instrumental in helping us make a theatrical return to my hometown in the summer of 2012. 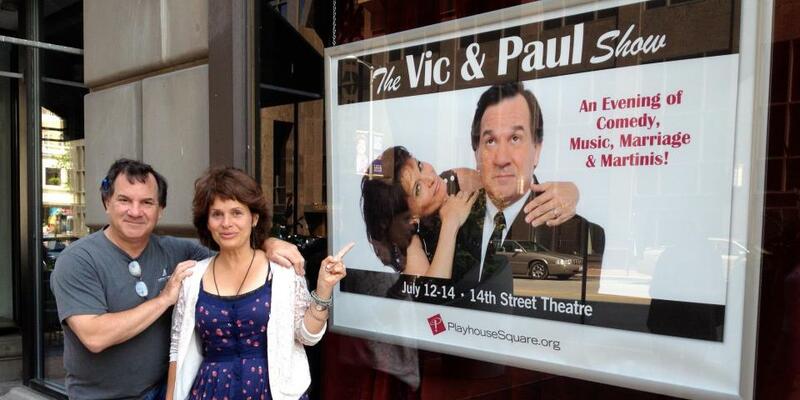 With Ray in our corner, our booking at the 14th Street Theatre in Playhouse Square was a great success. And why not? 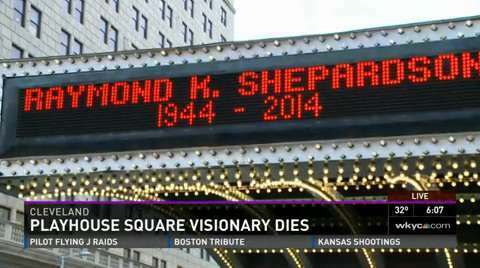 Ray Shepardson, success and Playhouse Square will always be synonymous. How do you properly recognize a force of nature? I’ve tried to do that, to some paltry degree, with this post. But mostly I want to say thank you, Ray. I dearly wish I had a chance to do as much for you as you’ve done for me. 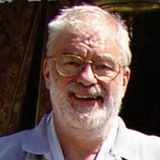 And flights of angels sing thee to thy rest, dear Ray Shepardson. We miss you. We’ll done, Barr. A fitting tribute with a great personal touch. What a nice tribute. As it happens, I’m going to a concert this Friday at the Chicago Theater. Will tip my hat to Ray while I’m there. What a nice tribute, Paul. How lucky to have known such a Man of the Theatre. A beautiful article, thank you! A great tribute to a great man! I grew up with Ray, we lived on dairy farms across from each other. I have so many stories and so many memories. I was so excited to think I had finally found him, and now I am heartbroken to find I have missed him….again. I have always cherished him and the times we had together. We grew up, left home and lost track of each other. I have tried to find him off and on with no luck. I got his Facebook page and just sent a message. Maybe his son will get it and answer. I have pictures of Ray and I together as little kids I would love to give to his son. I am just heart sick that Ray is gone!! Well, he is just keeping a place, waiting for me to join him, so we can run through fields together, dodging cow pies, and laughing.